After returning from a tour of duty during the war in Afghanistan, Alex Seymour needed a way to cope with the extremes he experienced as a member of the Royal Marine Commandos, losing 7 men in his unit, and having his best friend critically injured by a Taliban bomb. Drawing upon his pre-deployment experiences, Alex knew that entheogens could help him release his fears and traumas. But he also knew that simply taking psychedelics wasn’t enough--he needed ceremony, something sacred to draw meaning from his experiences, to help him reassess not only the war and his role in it, but his entire life. So he set out for the Amazon in search of the hallucinogenic brew known as ayahuasca and a shaman to guide him. Richard surprised us by announcing that the first ayahuasca ceremony would happen that night. Prior to our arrival, he had asked us to reflect on our intentions for the visit. Mine were simple: recover. After months of anxiety I needed to re-learn how to be content. I was lucky not to have PTSD, and I wanted to use this time to reflect and send out good intentions for the families of the men in my unit who had lost their lives or limbs. Furthermore, following the war, I wanted to know how I could integrate back into society and be inspired. With all the intensity of the last year, slotting back into previous roles might be challenging, and I was concerned I’d be hampered by the hum-drum aspects of modern life. When my name was called I crawled forward and accepted the proffered cup. Three or four gulps and it was down, the brown liquid gloopy, disgustingly bitter. Humberto began singing an icaro and the ceremony began. Icaros are songs to call in the spirits from the forest and luminal realms. I was feeling disoriented, aware of the near absurdity of my being here, sitting with strangers in the dark in a circle in the jungle, being serenaded by an ayahuasca master, knowing full well that in a few minutes something extremely strange would be happening. Within twenty-five minutes I started to glimpse the merest tickle of something at the edges of my peripheral vision. I tried to ignore it, deny its creeping inevitably. Two minutes later hallucinations came on in full force. I felt a strange energy moving through my body that made me nauseated. Humberto was singing with increasing vigor, his voice growing louder and clearer, feeding off the ayahuasca energy coursing through him, channeling it. Geometric shapes swirled kaleidoscopically behind closed eyes. They took on a more deliberate action, swooping wildly into my center of vision and away again like a swarm of bats, so clear and real that I flinched. They morphed into sleek angular reptilian creatures, swarming, popping out of nowhere, then just as quickly disappearing only to be replaced by even more bizarre-looking creatures. I still felt lucid and began to hope that it wouldn’t get any more intense--it was already beyond strange and who knew where it was leading. After half an hour I was in the full grip of the ayahausca. All the while, the icaros had been getting louder and more forceful, and Humberto was shaking two schacapa leaves. The effect was a rhythmic swishing sound that became unbelievably loud, adding to the texture of his singing. How on earth could a bunch of shaking leaves sound so loud? It filled the entire room. All senses on every perceptual level were heightened--maxed out. An unexpected sense of empathy was growing that became so strong it felt like a door was opening into a whole new and separate sense--as important and relevant as sight or sound--so powerful it scythed through all other emotions. There was so much more to perceive than just the content of this three-dimensional world. Incapable of resisting any longer, I opened my eyes. Ka-Boom! The entire room was full of alien life interwoven with a multicolored geometric mesh. Everything everywhere was made of throbbing neon electric grids of energy. The grids entwined with writhing sharp-toothed creatures that scuttled with dazzling, slinky agility. Fractal centipedes and millipedes possessed bodies that trailed off into infinity. They encroached in iridescent high definition, their bodies glistening, heavily armored. The visions were overwhelming. I was surrounded by fantastical alien beasts, spirits, entities--who knew what the hell they were. No time for introspection or to rationalize any kind of philosophical interpretation--scenes shifted and morphed with incredible intensity. I struggled to maintain my grip on any kind of ordered thought. How on earth could this ever be interpreted as therapeutic? Confusion reigned, and I sought some semblance of comfort, unconvincingly forcing myself to think, Everything will be fine. The sounds of the jungle--insects and frogs--were loud now, and they interwove with the swishing of the schacapa-leaf rattles until they reached an all-consuming crescendo that swept me up to ride the waves of a clamorous alien-sounding symphony. Oh my God! These Indians know exactly what they’re doing! They had had thousands of years to perfect it. I was journeying through a grotesque, carnivalesque world, and the icaros and rattles were the pilot and navigator. Sounds were things, and these things shaped my consciousness, which became as unnavigable as a termite caught in a tornado. grounding rod. This was the connection to an alternative LIFE FORCE and I had jacked into the main vein. Alex Seymour enlisted in the Royal Marines Commandos as a teenager, serving for 6 years and completing 2 tours of duty on active service. Twenty years later he returned to the service as the oldest front line commando in Helmand Province in Afghanistan. He is currently the Technology Account Director for a global technology company and lives with his wife and children in Buckinghamshire, England. ". . . the work does offer an interesting firsthand account of encounters far removed from many readers' calm and orderly lives." After six years in the Royal Marines Commandos from the age of 17, and then 20 years in the corporate world, Alex Seymour rejoined the military and returned to the front line. He was posted to Afghanistan, in Helmand Province, and the enemy was the Taliban. Already a husband and a father of two, Seymour wanted to explore what it meant to be a "good man". His tales of his tour of duty make for some hair-raising reading. But Seymour had another quest: to explore transcendent worlds. Before he signed up again with the military, Seymour experimented with psilocybin mushrooms and DMT; the awesomeness revealed to him meant that his life would never be the same again. He no longer feared death, as he came to realise that consciousness survives it. After his service, Seymour sought to take the entheogen adventure further and travelled to the Amazon to join a shaman in ceremonies centred around the hallucinogenic ayahuasca brew. In the company of other seekers, he again had direct perception of the sacred, and his experiences helped him recover from the war and set a path for the future. 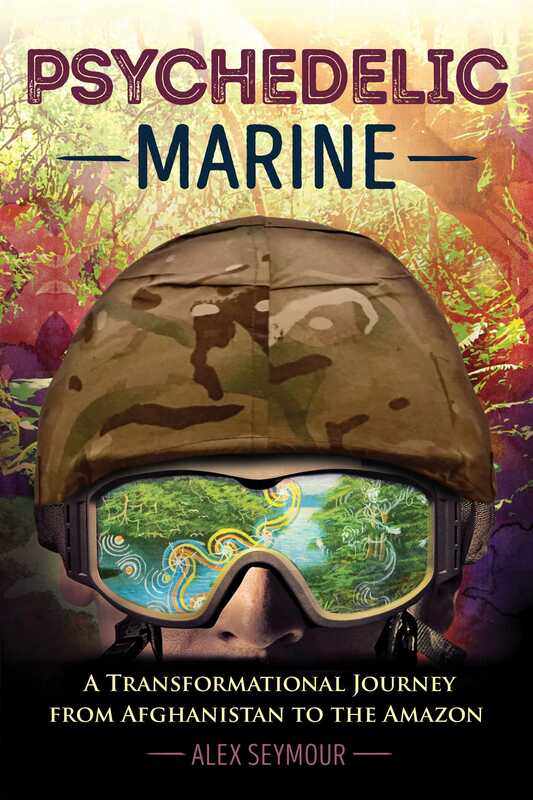 In his view, the ayahuasca ritual has the potential to prepare soldiers for war and to heal from it. It can offer a meaningful rite of passage for young military recruits and assist veterans overcome PTSD as well as alcohol and drug issues. Seymour's story of transformation has profound implications.